1959-60 Topps Hockey returned to a format that included only some of the teams in the NHL. This time, however, the first specialty cards appear. Card fronts feature a player picture superimposed over a two-color background. The background has a white block surrounded by one that is a different solid color. A team logo appears in an upper corner, while the player's name and position appear below him. A white border surrounds the card. 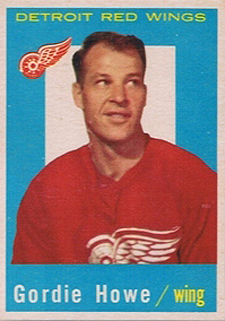 1959-60 Topps Hockey backs feature a red border surrounding a box that is slightly tilted. For the first time in a Topps set, the number is not inside a puck-shaped circle. It appears by itself in the upper left corner. Inside the box, the player's name, position and team stretch along the top, with a single line of the previous year's stats below. A player biography follows in black ink, with a French translation appearing below that in red ink. A general trivia question appears in the red area below the box. It is also bilingual and is flanked by a cartoon. Once again, 1959-60 Topps Hockey is limited to just the four teams that played their home games inside the United States: the Boston Bruins, Chicago Blackhawks, Detroit Red Wings and New York Rangers. Scattered throughout the set are six action cards, a natural subset for hockey. The action cards feature a caption that is meant to be humorous and are only printed in English. 1959-60 Topps Hockey has no major rookie cards. 1959-60 TOPPS COMPLETE HOCKEY SET HULL SAWCHUCK HOWE: OVERALL EX+ EXMT RARE!!! 1959-60 TOPPS COMPLETE (-3) HOCKEY SET HULL SAWCHUCK HOWE: OVERALL VG+ RARE!! !